A quirky biographical tale that, because of its comedy and fantasy elements, is difficult to distinguish truth from reality. 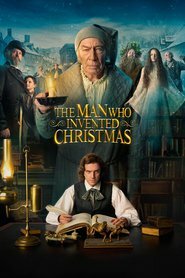 A unique way of telling the story that essentially has Dickens experiencing the story as we are told how the story was developed. At times, so over the top it was hard to take seriously. And it’s too long. I got a bit tired of it after a while. Would be ok to put on for the kids to watch on Christmas Day while the adults party.